Share important documents (permission slips, forms, contact lists, surveys, etc) online, securely with Google docs; send parents important information regarding the classroom, students and rely on parents to have access whenever they need to check in. Only busy moms know how chaotic these crisp fall months can be - from managing work and school schedules, to wrangling kids for soccer games every weekend, contributing to classroom parties and field trips, attending parent-teacher conferences - phew, the list goes on! 1. Download: Download the free bake sale kit from King Arthur Flour and get your hands on awesome, free printables, recipes, decorations and more - it's easy, click here! 5. Bake: Bake for GOOD! Turn your bake sale into a flavor fest for ending childhood hunger with King Arthur Flour. Register your bake sale today (you could win a KitchenAid Pro Mixer too), download a free bake sale kit and raise money for No Kid Hungry, click here. Great for class parties, school art projects, or simply a crisp fall weekend, they DIY leaf crafts for kids are simple, fun and beautiful. Everyone knows that family stories are important, but how often do we capture them? As a little girl, I loved the stories that my grandfather used to tell. Even though his stories were burdened with the sorrows of WWII and the Great Depression, I would cuddle next to him and listen with my entire being. I learned what it means to be brave and resilient in the face of hardship, and forged deep links between his identity and mine. How I wish I had written his stories down so I could share them just as vividly with my own children. · Storytelling Helps Us Process Our Own Experiences: In our modern, always-on always-connected world, it may feel like there is no time for breathing, much less reflection. Yet when we take a moment to share our stories, we gain insight into our own life experience. Stories are how we make sense of the things we do, and the things that happen to us. Stories are a powerful engine of personal growth, and also a primary way to teach others. · Stories Deepen Connection: A story opens up a little piece of you to someone else and invites them to share back. We give a little, get a little, and step-by-step our relationships deepen. We feel “seen,” “known” and “validated” as we experience this give and take, and it offers us a chance to practice walking in someone else’s shoes – a major key to building empathy. · Family Stories Develop Resilience in Children: Dr. Marshall Duke at Emory University has found that children who have a realistic sense of their own family history tend to be more resilient in the face of adversity, which is in itself one of the strongest predictors of future success. Family stories give kids a sense of being part of something much bigger than themselves. If the family narrative includes a balance of stories that show family members handling both good and bad times, children learn that ups and downs are the normal rhythm of life. They see that people just like them have the strength and resourcefulness to overcome hardship and still succeed. Deep down, they internalize resilience. · Stories Reveal Who We Are: From the youngest to the oldest, people relate to stories, and it is one of the most fundamental ways that we share ourselves with others. Our stories communicate our values and beliefs, and reveal who we are as people, transmitting the essentials of our human experience and the wisdom we have gathered along the way. · Stories Show how People are Interconnected: Some of the most important stories show the impact that one can have on the life of someone else. For example, my father always talks about my Great-Grandmother and the extreme generosity that she showed to him, as well as to total strangers. When he speaks of her, he has a reverence in his voice that he seldom uses. It’s easy to see that she was special for him, and also that she embodied a quality that he greatly admires. Through her, generosity became a core family value. As a new school year gets underway, we’d like to challenge you to capture your family’s favorite stories. Written stories have the huge advantage in that they can be preserved and cherished as part of your family’s history. Weeva makes collection and preservation of family history easy and fun! Weeva provides free online tools that make it easy to capture memories and photos from the people who helped create them in the first place. Once your stories are collected, ask us to turn them into beautiful books and keepsakes that can be passed on to your kids, gifted to grandparents and shared with family. You can get started in just minutes <link to weeva>, and reap the benefits over many lifetimes! Kim Gorsuch is the Founder and CEO of Weeva. Weeva was born when her father became suddenly ill, and it became clear that one day she would lose access to his stories. Given this wake-up call, she acted to create an easy way for everyone to collect, share and preserve precious memories of the people, places and events that matter most to them. Communicate in a Whole New Way with ZapVM! At VolunteerSpot, we're always looking for fun, new apps that help families connect - our fave new find is ZapVM for iPhone, download it now for free! - the list goes on! My 10 year old boy used the iPad to walk around the back yard and take images to share with the grandparents way over on the other side of the country. They will be visiting soon so he wanted to show them our house and yard before they get here. It’s super cute listening to him narrate our world for the grandparents! Too cute! How will you use ZapVM? Download it today and get started! Tues. Sept. 23rd, 2014 at 12p ET - register now! Healthy Kids | Choose Foods that Win! Our newest theme in the VolunteerSpot ‘Back 2 Cool’ Sweepstakes event is Healthy Happenings for Healthy Kids. Making smart food choices for your children is a priority for every parent. It’s also important for your school to keep food-focused volunteer activities like potlucks, picnics and parties organized, healthy and fun! $500 Healthy Kids Grant from emeals– use it for a cafeteria or playground spruce up! $500 Soap.com gift card – think of the all the goodies your school could buy! Blue Avocado: BlueAvocado is synonymous with thoughtful designs and creative solutions for a greener, simpler life. Best known for its iconic (re)ziptm family of products and reusable shopping and lunch systems, BlueAvocado products minimize the use of disposable bags and exemplify the company's commitment to smart solutions for life’s throwaway problems. eMeals: takes care of the meal planning, the grocery list and the budgeting — while you take credit for making healthy, home–cooked meals that your whole family will love. Every week a personalized meal plan arrives in your in-box complete with seven simple, delicious, family-friendly dinner recipes. Love the meals. Leave the planning. Soap.com: Soap.com brings your favorite drug store to your computer or smartphone with over 25,000 products under one virtual roof. From beauty basics and household necessities, to the nutritional products that keep you feeling your best – they’ve got you covered. No lines. No heavy bags. No driving. Just the products that keep your life in balance, conveniently shipped to your door faster and easier than any errand you've done before. The Fall football season has officially kicked off and chances are your school parents are making time to get together and cheer on their favorite teams - whether it's at a Friday high school game, a Saturday college division game or simply catching the NFL Monday Night Football match-up. 3) Host a Game Watch Party at your school! Make an event out of the big game this season with a potluck, party, or community event where families can join together and watch the action on the big-screen! Sell your BRAX Fundraiser products at a booth on-site and boost profits while having fun. 4) Turn Game Night into Giving! Friday night football games are HUGE community events for schools and a fantastic way for school families to give back! Ask families to donate non-perishable food items when they attend a game, that can be given to a local foodbank. Or have them sign a graffiti wall (simply paper a nearby flat surface like the wall on the concession stand) - ask families to right their thanks for all the Booster club parent volunteers. 5) Host a Tag Football Game: Rally staff members, teachers, and educators to participate in a tag football game to raise money! Students will love seeing their beloved teachers get in on the fun, and families can make a day of it. 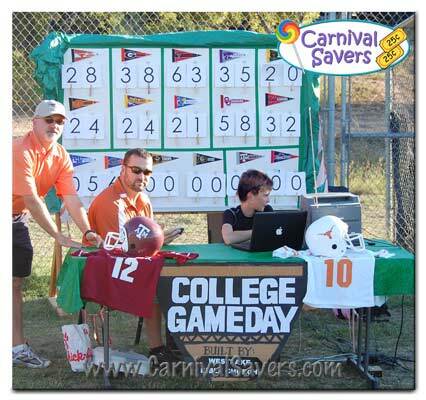 Add a BRAX Fundraiser booth to your game to boost profits, and consider selling t-shirts, concessions and tickets. Special thanks to our friends and sponsor, BRAX Fundraising for this post! 1. Yoobi.com: Bright, colorful school supplies from Yoobi come with a special twist – for every Yoobi item you buy, they donate a Yoobi item to a US classroom in need! What better way to give back then by shopping for those last-minute items you already need. Available online at yoobi.com and in Target stores nationwide. Check out Yoobi today for back to school essentials, desk accessories, arts and crafts, and much more! 5. FeedingAmerica.org: September sees all schools in the United States back in session – and it coincides with National Hunger Awareness Month. What better way to kick off the school year than by giving back and helping fight hunger in your community. Spread awareness, find a food bank near you to donate to, and more at FeedingAmerica. Thanks to our sponsor Yoobi for this great post! At VolunteerSpot, we love online tech tools and applications that help make parents lives easier. For that reason, we asked our friends and sponsor at KwickLook to share a little bit more about their social media monitoring resource for parents, check it out! Parents are faced with the near-impossible task of making sure their children are safe and in good company when they’re on social media. I invented KwickLook to help me keep an eye on my kids’ social media activity. It’s the easiest way for other parents to have peace of mind when their kids are using social media. KwickLook is the first and only tool that enables parents to monitor their children’s social media use specifically. Parents receive a daily email with the 3 most important updates that their child posted, was mentioned in, or commented on across each of their social networks. This email is called Your Daily Email and it only takes 2.8 seconds (!) to read. Parents can take a closer look at their child’s activities in a dashboard view by logging in to KwickLook or clicking on a post in Your Daily Email. Unlike Net Nanny or filtering software, KwickLook doesn’t stop kids from being kids—it just keeps their parents in the loop so they can be there to help and guide them. KwickLook DOES inspire conversations with their kids about trust and boundaries, and our website has tips for parents on how to ask for their child’s passwords. KwickLook integrates with The Big Four: Facebook, YouTube, Twitter, and Instagram. KwickLook costs $3.99/month or $19.99/year (20% off). Parents can add as many kids as they have. Get started today for free at www.kwicklook.com. Getting more parents to participate in school events and classroom activities this year is simpler with these 5 free apps – download them today and spread the word at your school! Related: How to Coordinate an Online Volunteer Calendar, Fast! 5. Add Artists to Classroom Enrichment Lessons: How neat would it be for a classroom of students to watch a real potter at work? What about a painter? A dulcimer player? Encourage teachers and room parents to connect with class parents and find out if there are any hidden talents or connections with local community artists that might be shared for enrichment lessons in the classroom. Bonus tip: Be smart and incorporate a Square 1 Art fundraiser into supporting school budgets that are dedicated to celebrating the arts and bringing artists, performers, and cultural experts into the classroom! Not only do you create life-long memories for kids with creative and unique arts programs like these, but you inspire them to know that the arts, in whatever form it may take in their lives, is special, real, and worth pursuing.